While I do not get to play around in the kitchen as much as I would like, I was fortunate that my friend Nat invited me to help cook dinner on Saturday for a group of our friends. He is always up for experimenting so this gave us the chance to try an idea I have had in mind for a few weeks: sous vide chicken fried steak. Chicken fried steak, in its classic rendition, is a usually inexpensive cut of steak pounded to tenderize it, coated and fried like a piece of chicken and served with gravy. During season thirteen of Top Chef, chef Jeremy Ford tried the technique of cooking a nice cut of steak in the sous vide, “gluing” chicken skin to the steak using transglutaminase and then frying the end result so the chicken skin was crispy. I was interested in trying this technique. We followed a similar preparation, cooking a very nice grass-fed filet mignon in the sous vide until rare and then slicing it into medallions. The benefit of sous vide is that by cooking the food in a vacuum-sealed bag immersed in a water bath, the entire piece of food reaches exactly the desired temperature and then cooks no further. Instead of the outside of the steak being cooked and the inside being raw, as might happen when you fry or roast a steak, the entire cut was a consistent 131 degrees Fahrenheit and still a pretty pink. As the meat cooked, about two-and-a-half hours, we skinned whole chickens, basically turning them inside out. This was an interesting experience, something I have never done before. The end result are these sheets of chicken skin (seen layered in plastic wrap, above) with little “fingers” of skin like a glove where the legs were. I then wrapped the chicken skin around the steak. Trying to get the chicken skin cut to the right size was a bit tricky, and some extra transglutaminase was needed where there was overlap of the skin. Normally, it takes about two hours of refrigeration for the “glue” to firm up. But a quick trip back in the sous vide for about ten minutes sped up the process, resulting in this tightly-wrapped packages that looked a bit like duck breasts. When it was nearing time to serve, we dredged the pieces in a mixture of flour, salt, pepper and chili powder and fried them in about two centimeters of rice bran oil. The end result was a crispy skin and a steak that was a perfect medium rare. We served this with an onion gravy and salad. All in all, the result was positive. We could experiment with more consistent portion control – sizes of steaks varied a bit – and maybe a liquid batter instead of a flour batter. But, overall, I would rate this a culinary success. Most weeknights, Tawn and I try to eat dinner at home. Whatever I cook, it almost always includes a salad with lots of vegetables. This is our attempt to fill up on veggies, rather than on meats and carbs. 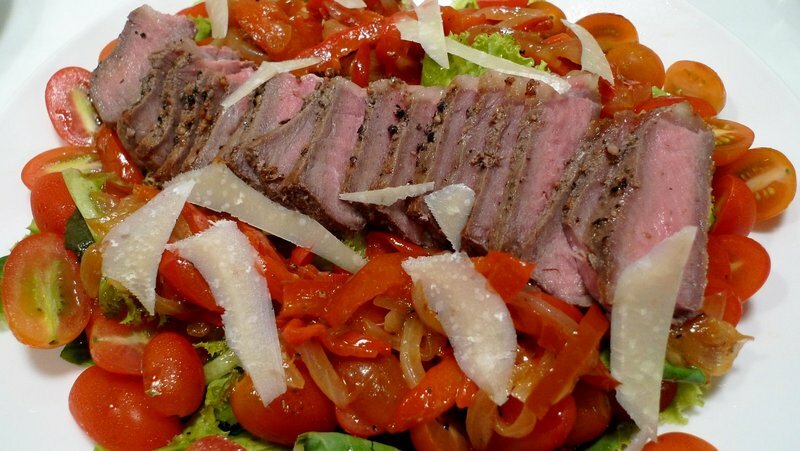 Sometimes, I try for something a little fancier like this steak salad with thin slices of American sirloin, roasted red peppers and onions, and shavings of Parmesan cheese. Most of the time, though, the salads are a little less ambitious. Weekday breakfasts are also eat at home meals, usually oatmeal with a combination of dried fruits and nuts, sometimes with a little quinoa, which provides some protein to start my day. Since I work from home, my lunches are also usually eaten at home, often leftovers from dinner the night before. From time to time, though, I will step out for lunch, stopping most often at a neighborhood ramen shop for some noodles. All this weekday eating at home is offset by frequent social events on the weekends, when we end up eating out for most of the meals. On both Saturday and Sunday this past weekend, we had engagements for lunch and dinner. The odd calculus of this pattern of socializing is that while my wallet gets thinner, my mid-drift gets thicker.